How often do you think about the coefficients of thermal expansion of the various materials used in the construction of your bicycle? All the time, right? Steel, titanium, aluminum, carbon fiber; they all have distinct properties that make them better or worse for specific applications. Strength and stiffness are arguably the most important properties for structural elements of a bicycle. Other important properties include corrosion resistance, fatigue resistance, machinability, and even appearance. I think brushed titanium is a rather attractive look. But today I want to talk about coefficient of thermal expansion, or CTE. To be more specific I am talking about linear CTE. The units of a linear CTE are length per length per temperature change. For instance: inch per inch per degree Fahrenheit. The CTE’s of most structural materials are very small. As an example, heat a 1” long steel bar one degree Fahrenheit and its length increases to about 1.0000065”. (CTE of steel = about .0000065 inches/(inch degree F). Here’s a table of CTE’s for common bicycle materials of construction. Keep in mind that the CTE of an alloy can vary quite a bit depending on proportions of specific elements present. Notice that aluminum has the greatest CTE of any of the materials commonly used on bicycles and components. This is a very useful fact. So what? Do you care if your bicycle gets unmeasurably larger as the day heats up? I’m certainly not going to stop to lower my seatpost. But it gets interesting – and useful – where different materials come together. I’ve found another opportunity for application of differential thermal expansion – press-fit bearing installation and removal. I was replacing bearings in a ZIP 303 hub when it occurred to me. The bearing race is steel (or possibly stainless steel). The hub is aluminum. Heating the assembly made it easier to drive out the old bearings because the ID of the aluminum hub expanded more than the OD of the steel bearing. Caveat: With a good heat gun you could cook the grease and seals in the bearings – and burn your hands. But presumably you’re removing the bearings to discard them. 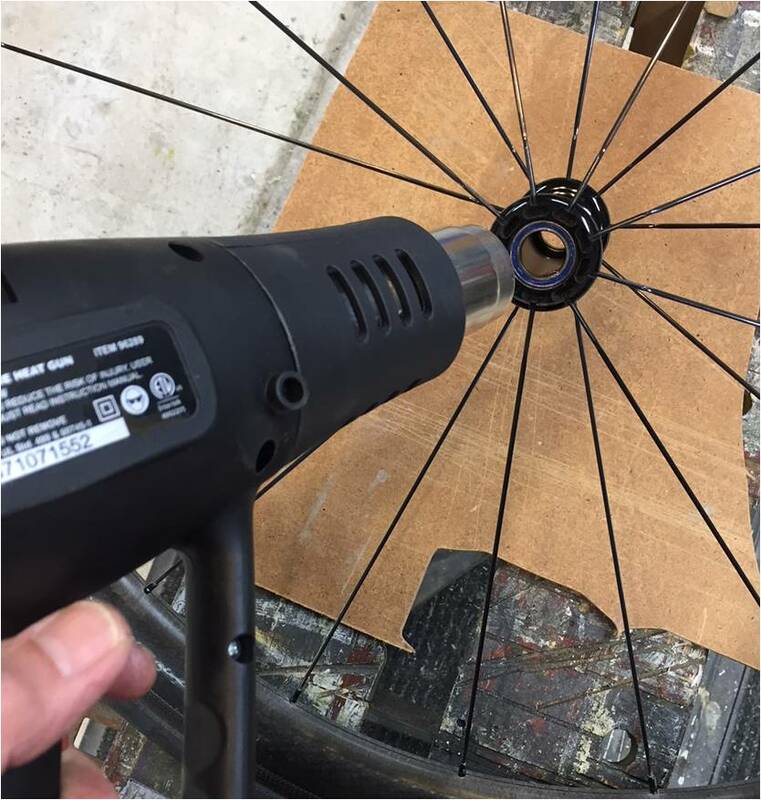 A heat gun is not going to overheat the aluminum of the hub. The advantage of differential CTEs is even greater for installation of new bearings. You can heat the aluminum hub, and keep the steel bearings cool until you are ready to press them in. This way the hole in the hub is as big as it can be and the bearing is as small as it can be. With this technique I was able to press in my 303 hub bearings most of the way by hand! What about press-fit components on frames, such as bottom bracket bearings and headset cups. I have used heat successfully to ease removal of a pair of steel headset cups out of an aluminum frame. But you want to be very careful heating a frame. Be very gentle with the use of heat around carbon fiber or painted aluminum. Paints and resins are organic materials. They can melt and even burn. My rule of thumb for heating carbon fiber is if I can’t hold it in my hand it’s too hot. Consider a bucket of hot water for controlled heating of carbon fiber. If a metal bearing is pressed into a carbon fiber shell, don’t even bother heating it to loosen it. Heat will only make it tighter because the steel expands more than the carbon! Try giving it an ice bath? I guess carbon fiber has something in common with 0-4 degree C water. I’ve read a bit about why water shrinks as it warms from 0 to 4 degrees, and it relates to the near-freezing water forming crystalline structures that take up more space than the loose molecules. Seems reasonable that carbon fiber could be doing something similar– I can imagine that at room temp the fibers or the polymer between them or something, could form some structure that takes up more space, which falls apart as it heats. Next Next post: SRAM eTAP – Wireless Electronic Shifting is Pretty Cool!